Conditional Edit Access to Datasets and Users Maps in the Category. NOTE:If a new element with different Data Source is added to the Category at some time after the Power User has been granted Category Edit Access, use of the new Data Source will NOT be automatically granted to the Power User. Access to the new Data Source must be granted manually. It is always possible to remove Category Access from the Power User and then re-grant it, thus allowing the Power User to gain use of additional Data Sources. Another caution, however: If Category Edit Access is removed from a Power User, use of its related configurable Data Sources is NOT taken away from that Power User. If elements, Datasets or User Maps in the Category are sourced from one or more non-configuable Data Sources, the Power User must be granted the respective Privilege and/or source element or dataset access Permissions to make it possible to edit the related object. The related requirements are discussed below. Power User must have View Access to the source Metric from which aggregation is performed. 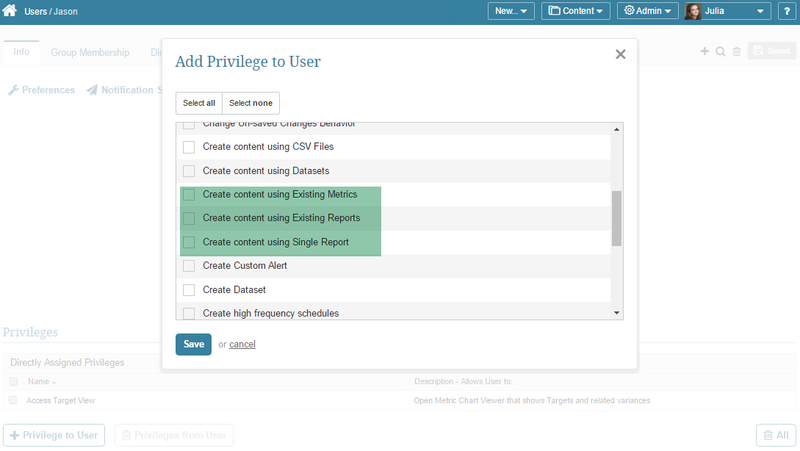 The Power User must have Permission to View all source; i.e., "charted" elements of any Multi-Metrics in this Category. If Edit Access is granted to Power User for a Category that is "nested" (i.e., has one or more child Category), user does NOT receive automatic Use Access to the configurable Data Sources used by elements in its Child Categories. If elements in the Category are dimensioned, each User must be granted access to at least one Dimension Value of the Dimension associated with each element from the Category or to the whole Dimension in order to View or, for Power Users, edit the element.